... with The Message: SOLO Women's Devotional. 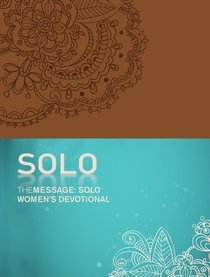 Each reading in The Message: SOLO Women's Devotional opens your heart to hear God's voice. Start anytime, and go at your own pace. Through 180 devotionals, you'll cover topics close to your heart, like trust, hope, forgiveness, patience, and joy, and there's plenty of space for journaling. With The Message: SOLO Women's Devotional, you will begin reading, reflecting on, praying, and living the Scriptures in your everyday life. About "Message: The Solo Women's Devotional (Tan)"
Dr. Eugene H. Peterson is a pastor, scholar, author, and poet. He has written nearly thirty influential books including, Praying with the Psalms; Praying with Jesus; Reversed Thunder; Leap Over a Wall; Run with the Horses and Answering God , but he is best known for The Message: The Bible in Contemporary Language a contemporary paraphrase of the Bible. Eugene Peterson was educated at Seattle Pacific University, New York Theological Seminary, and Johns Hopkins University, and in 1962, Peterson became founding pastor of Christ Our King Presbyterian Church in Bel Air, Maryland, where he served for 29 years before retiring. He is Professor Emeritus of Spiritual Theology at Regent College in Vancouver, British Columbia retiring in 2002. His most recent publications have been the Spiritual Theology Series including Eat this Book; Christ Dances in a Thousand Places; The Word Made Flesh; The Jesus Way and the fifth volume Practising Resurrection.